I love this comforter. It’s lightweight and not very thick. I haven’t tried washing it yet, and that would definitely play a part in the review, and, so, without this information yet, I give this comforter a high rating. 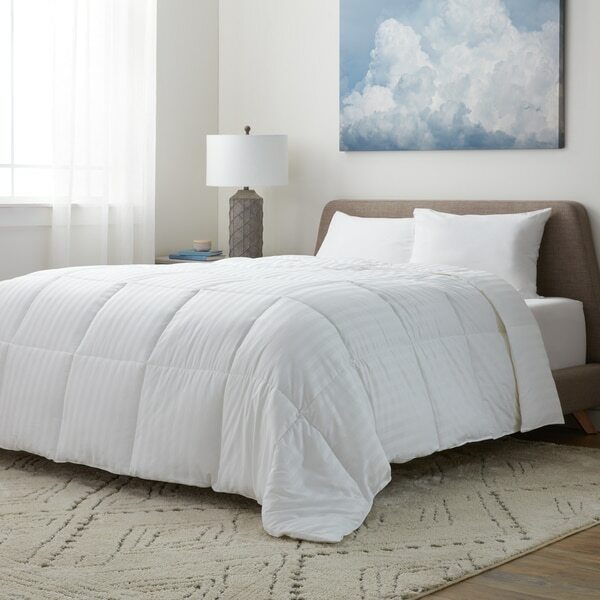 Made with a 350 thread count cotton damask shell and hypoallergenic downalternative, this supreme comforter is perfect for curling up under on coldnights and even better for cold mornings. This excellent piece is machine washable and features box stitch construction that keeps the fill in place. I just love this! It took me over a year to find a microfiber fill comforter in white with a cotton exterior. I love damask so this made it even better. I hate that birds have to suffer for down and I refuse to buy into that. This is also so comfortable because it feels light and you can really wrap up in it unlike down that is stiff and just lays on you. Great purchase and great price. Very high quality! After receiving this down alternative comforter, it says to wait a while for it to regain its fluffiness. I've had it for months and it is not at all like a down comforter. I almost wish I would have just gotten a regular comforter or spent the money to get something worth buying. within a few nights the polyester balls up on the exterior of the comforter like lint balls. very uncomfortable to sensitive skin. I would return, but did not keep packaging. soft warm & machine washable & cotton. This is a great down alternative! The average thread count still makes this comforter quite soft. It is large and puffy, just as the picture shows and launders easily--which is an plus as a down alternative. It is warm but also light weight. I would order again. I was looking for a down alternative that was real cotton, not this new synthetic material they use these days... this is 100% cotton and is beautifully made, and a quality piece, thank goodness we still make this quality bedding every so often. This is by far, hands down, the best comforter I’ve ever owned! It’s over size, so it fills up any duvet cover. It’s so fluffy and the fabric is luxuriously. That cuddle cover. I like this alternative down comforter, because, unlike down comforters, this comforter is machine washable. I have a special needs daughter, so a real down is not a viable option. I purchased three of these alternative down comforters, and the machine wash well. Good quality and I am still using it inside a duvet cover for 2 years. I was skeptical when it first arrived, vacuum packed and flat as a pancake. Even after I let it air out, it was still pretty flat. Once I washed and dried it, it is so fluffy and the material is so soft! Very happy with it now and will buy a 2nd one if it goes on sale. Great! Very happy with our purchase. It is super comfy to sleep with. Can't believe the price! Light and warm. Makes my bed soft and warm. The stripes makes it look like hotel linen. I truly love this comforter it’s great for all seasons. It’s not too heavy or too light, it really makes you feel your in a cloud. I ordered one for me and one for my pregnant niece and we both want one for every bed! This is a great filler. Slightly thin but works well for what I ordered it for. This comforter was just perfect!! I ended up ordering 3 more since my daughters all wanted one too! "Have fire retardants or any type of chemicals been used in this duvet?" "Is the outer shell 100% cotton or a blend?" "How accurate is the picture, is comforter fluffy?" Meh. Not really. Definitely not as fluffy as the picture. It's a light weight down alternative but I will say it keeps you warm. When i opened it I was a little disappointed but it is VERY VERY soft. We have used it all winter and i live in upstate ny where we just had 24 inches of snow dropped On us and it kept us warm. So no, Not fluffy but soft and works. It is not really fluffy. It is a light to medium weight. It is very soft and good quality. I found it to be Pretty Close to the picture, its a great buy. soft and fluffy. "does this duvet have tabs for attaching to the inside of a duvet cover?" Hello MissLinds, this does not have tabs. Thanks for shopping with us! I had been looking for this particular cotton damask stripe in the "down alternative" for the past few weeks. Price to "the look & down alternate" was a must have. looked like it was good quality.